Volunteers at Tait Park hard at work. This weekend we organized two community tree planting events at Tait Green Triangle Park and at Hamilton Recreation Center. 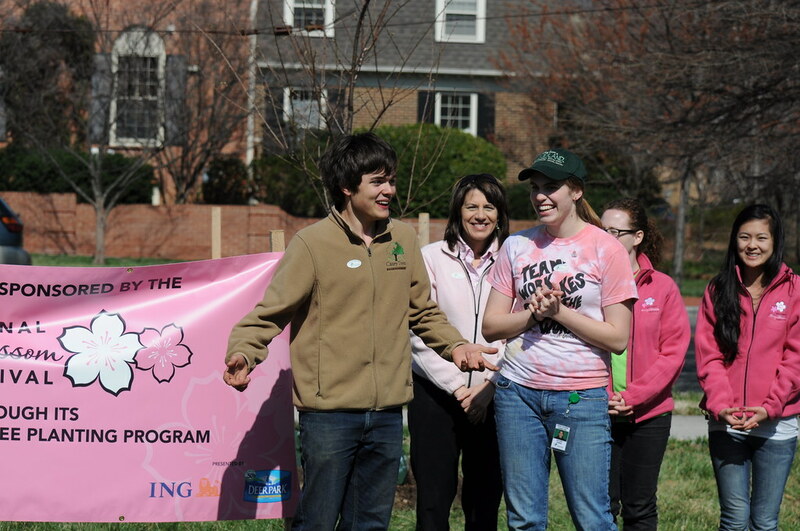 Both plantings featured cherry trees sponsored by the National Cherry Blossom Festival. 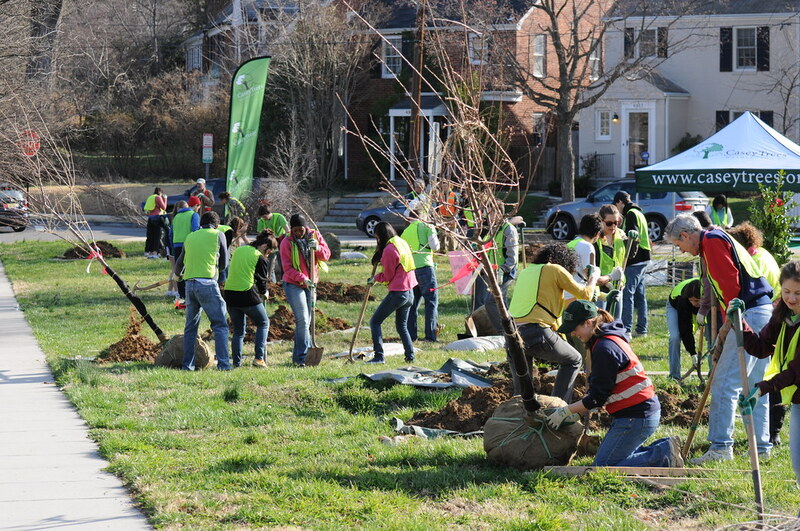 Our first Saturday planting took place at Tait Triangle Park, a small park on the edge of the D.C./Maryland border just north of American University. We had 46 volunteers in attendance, including five Citizen Foresters, six DC Cares volunteers, 20 American University student volunteers and five Casey Trees staff. We would especially like to thank Project Organizer Michelle Pangallo and Lead Citizen Forester Stephen Bronskill for helping make this event possible. On this triangular open canvas of grass, we planted 14 trees, including three cherry trees. Of course, there are always surprises at a Casey Trees planting: in a flash of excitement and peril, the Casey Trees tent went flying in a gust of wind, directly toward a group of volunteers. Staff quickly brought the flying tent under control, but one of the supports was damaged and the tent could not be closed. Crew Chief Michael Nelson was able to repair the tent to the point of closure and saved the day. Closing remarks after planting trees at Tait Park. After planting trees, we gathered to hear remarks from neighbors, Friends of Tait Green Park group, AU's Ecosense student group, Councilmember Mary Cheh, National Cherry Blossom Festival President Diana Mayhew and appreciated a poem from a neighborhood girl who composed a poem for the occasion. You can see more photos from the Tait Triangle tree planting on Flickr. We also planted trees at the Hamilton Recreation Center in the 16th Street Heights neighborhood. 10 trees were planted, including three cherries, a dawn redwood, a red maple and a ginkgo. There were 39 volunteers in attendance, including seven Citizen Foresters and six staff members. Special thanks go out to Project Organizer Brenda Oliver and Lead Citizen Forester Katherine Lin! Check out our online calendar of events and register as a volunteer so you can lend a shovel to more tree planting events this spring.